Garbini is an one stop solution for your eCommerce requirement. This theme comes with a neat and clean design and amazing options. It has Power Admin control and flexible to customize. This theme is a best solution for a fashion, cloth stores. Garbini is a fully responsive prestashop theme with lots of features and easy to manage Theme control panel and embedded with unlimited customization possibilities, suitable for every type of products. It’s perfect for any kind of web shop. It looks great with all types of devices (laptops, tablets and mobiles). 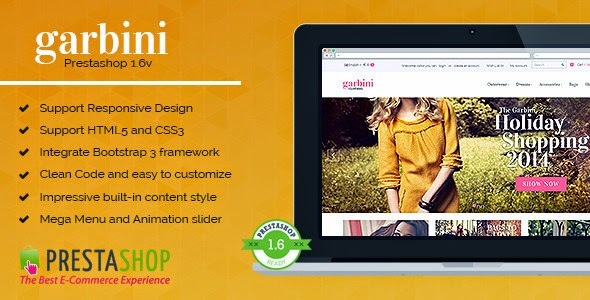 Item Reviewed: Garbini New Stylish Prestashop Theme 9 out of 10 based on 10 ratings. 9 user reviews.